It is ironic that the very state in the United States with the longest and most varied history of body decoration (including tattooing) is the last of the states to legalize the art of tattooing. 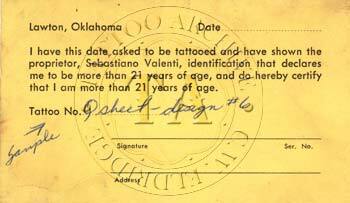 On May 3, 2006 Oklahoma Legalized Tattooing. Oklahoma, the last state with a prohibition on tattooing, had finally legalized it. The state gets its name from two Choctaw Indian words, okla, meaning people, and homa, meaning red. The name means Land of the Red People. Oklahoma is a fitting name for the state because it became home for many displaced tribes from the east. The first white men to enter this area were members of the Spanish expedition led by Francisco Vázquez de Coronado in 1541. They were looking for the golden city of Quivira but found tribes of Indians hunting buffalo across the plains and raising corn in settlements on the river banks. The Caddo, Witchita, Comanche, Osage, Cheyenne and Arapaho tribes all lived in the area when the Spanish arrived. From 1825 to 1842 a sad procession of homeless Indians moved west into Oklahoma. These Indians were known as The Five Civilized Tribes: the Cherokee, Creek, Chickasaw, Choctaw and Seminole. They had been forced by the United States Government to give up their eastern land to the white settlers. Most of these tribes had a history of tattooing or body painting. 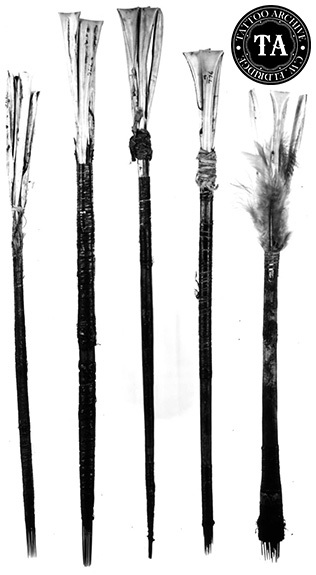 Following is some information on the body decorations of these tribes. Caddo - Both sexes tattooed their faces and bodies. Some men had figures of birds and animals tattooed on their bodies, while others had zigzag lines as ornaments. Tattooing was highly important to the Cherokee. At an early age a boy was tattooed with designs of flowers, animals, stars and suns. Arapaho - Face and body painting was practiced, especially in ceremonies like the Sun Dance. 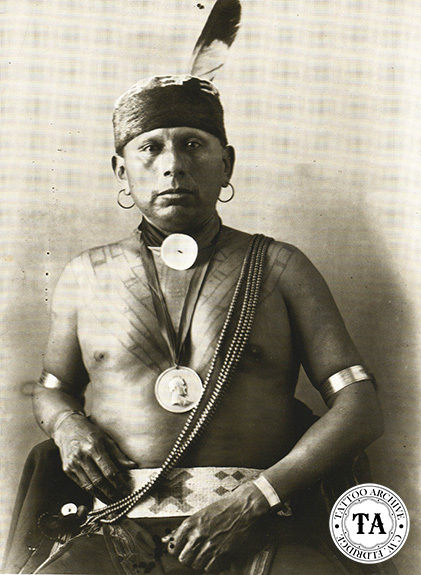 Osage - This tribe used both body painting and tattooing. Women were tattooed on their foreheads with a black circle representing the sun while men had dots tattooed on their faces. 40 years or so after the United Statea had driven many eastern Indians into the land now known as Oklahoma and declared it "Indian Territory," the United States government was forced to buy some of the land back and open it to white settlers. On April 22, 1889, 50,000 settlers waited for the signal to that would start the largest land boom in US history. Within days, Oklahoma City and Guthrie had populations of over 10,000 each. Modern tattoo history since the 1900s in Oklahoma is spotty. Oklahoma City had Leon and Bob at 419 West Grand. In the city of Lawton, a tattooist working under the name Stubby was located at 1415 South Second Street. Fred Musselman and Sebastiano Valenti also worked in Lawton, but their addresses are unknown. 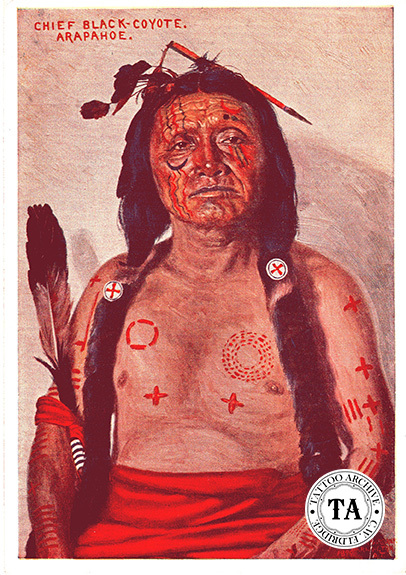 In the book Life as a Sideshow Tattoo Artist, Stoney Knows How by Alan Governor, Stoney St. Clair talks about an Oklahoma Indian tattooist named Chief Many Ponies. Unfortunately the Archive does not have any information about him.